For other uses, see Kabuto (disambiguation). Note that in Japanese language the word kabuto is an appellative, not a type description, and can refer to any combat helmet. Japanese helmets dating from the fifth century (long before the rise of the samurai class) have been found in excavated tombs. Called mabizashi-tsuke kabuto (visor-attached helmet), the style of these kabuto came from China and Korea and they had a pronounced central ridge. The kabuto was an important part of the equipment of the samurai, and played a symbolic role as well, which may explain the Japanese expressions, sayings and codes related to them. One example is Katte kabuto no o o shimeyo (lit. "Tighten the string of the kabuto after winning the war"). This means don't lower your efforts after succeeding (compare to "not to rest on one's laurels"). Also, kabuto o nugu (lit. "to take off the kabuto") means to surrender. A suji bachi kabuto with the cords tied under the chin; note the prominent front crest, the recurving fukigaeshi, and the shikoro composed of hundreds of interlaced scales. A small opening in the top of the kabuto, called the tehen or hachimanza (seat of the war god, Hachiman), was thought[according to whom?] to be for passing the warrior's top knot through. Although this practice was largely abandoned after the Muromachi period, this opening may have been retained for purposes of ventilation or simply as an artifact of how the plates were riveted together. The tehen was usually decorated with tehen kanamono, which were rings of intricately worked, soft metal bands often resembling a chrysanthemum. Zunari kabuto and momonari kabuto were two helmet forms that did not usually have an opening at the top. Many wavy shaped hagi-no-ita plates form a hachi. A colourful tehen kanamono can be seen at the top. The fukigaeshi can be seen to both sides of the mabizashi (brim), and the shinobi-no-o (cord) secures the mengu (facial armour). 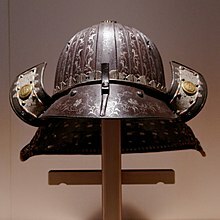 Suji bachi kabuto is a multiple-plate type of Japanese helmet with raised ridges or ribs showing where the helmet plates come together; the rivets may be filed flat or they may be left showing, as in the hoshi-bachi kabuto. Hoshi-bachi kabuto (star helmet bowl) with protruding rivet heads, have large rivets (o-boshi), small rivets (ko-boshi) and a rivet with a chrysantemoid-shaped washer at its base (za-boshi). Hoshi-bachi kabuto could also be suji bachi kabuto if there were raised ribs or ridges showing where the helmet plates came together. Hari bachi kabuto is multiple-plate Japanese hachi with no ribs or ridges showing where the helmet plates come and the rivets are filed flush. The zunari kabuto is a simple, five-plate design. A great number of simpler, lightweight, folding, portable armours for lower-ranking samurai and foot soldiers (ashigaru) were also produced. These were called tatami armour, and some featured collapsible tatami kabuto (also called choshin-kabuto), made from articulated lames. Tatami kabuto did not use rivets in their construction; instead, lacing or chain mail was used to connect the pieces to each other. Kaji kabuto were a type of helmet worn by firemen. Jingasa were war hats made in a variety of shapes, worn by ashigaru (foot soldiers) and samurai, which could be made from leather or metal. 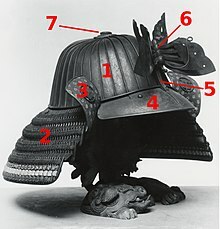 During the Momoyama period of intense civil warfare, kabuto were made to a simpler design of three or four plates, lacking many of the ornamental features of earlier helmets. To offset the plain, utilitarian form of the new helmet, and to provide visibility and presence on the battlefield, armorers began to build fantastic shapes on top of the simple helmets in harikake (papier-mâché mixed with lacquer over a wooden armature), though some were constructed entirely of iron. These shapes mimicked forms from Japanese culture and mythology, including fish, cow horns, the head of the god of longevity, bolts of silk, head scarves, Ichi-no-Tani canyon, and axe heads, among many others. Some forms were realistically rendered, while others took on a very futuristic, modernist feel. Za-boshi kabuto (chrysantemoid-shaped washer at the base of the rivet), this is also a suji bachi kabuto, as it has raised ridges. ^ Bryant, Anthony J. (1991). Early Samurai: 200-1500 AD. Angus McBride, Ill. Osprey Publishing. p. 45. ^ Sinclaire, Clive (2004). Samurai: The Weapons and Spirit of the Japanese Warrior. Globe Pequot Press. p. 26. ^ a b Louis, Thomas; Ito, Tommy (2006). Samurai: The Code of the Warrior. New York: Sterling Publishing Co. p. 94. ^ a b Ratti, Oscar; Westbrook, Adele (1973). Secrets of the samurai: a survey of the martial arts of feudal Japan. Boston, MA: Tuttle Publishing. p. 211. ^ Bryant, Anthony J. (1994). Samurai 1550-1600. Angus McBride, Illust. Oxford: Osprey Publishing. p. 25. ^ Transactions of the Asiatic Society of Japan - Page 279 Asiatic Society of Japan - 1881. ^ Deal, William E. (2007). Handbook to life in medieval and early modern Japan. Oxford: Oxford University Press. p. 172. ISBN 978-0-19-533126-4. Wikimedia Commons has media related to Kabuto.